My mother always told me I was born in the wrong decade. I’ve always had an affinity for anything vintage, particularly the 1960s and 70s. 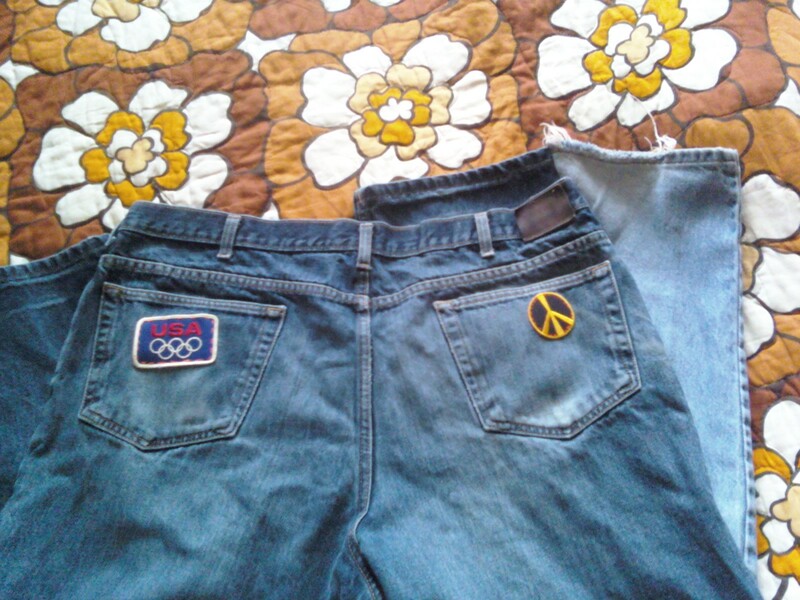 I decided last week to upcycle a couple of pairs of my old jeans into a custom pair of bell-bottoms. 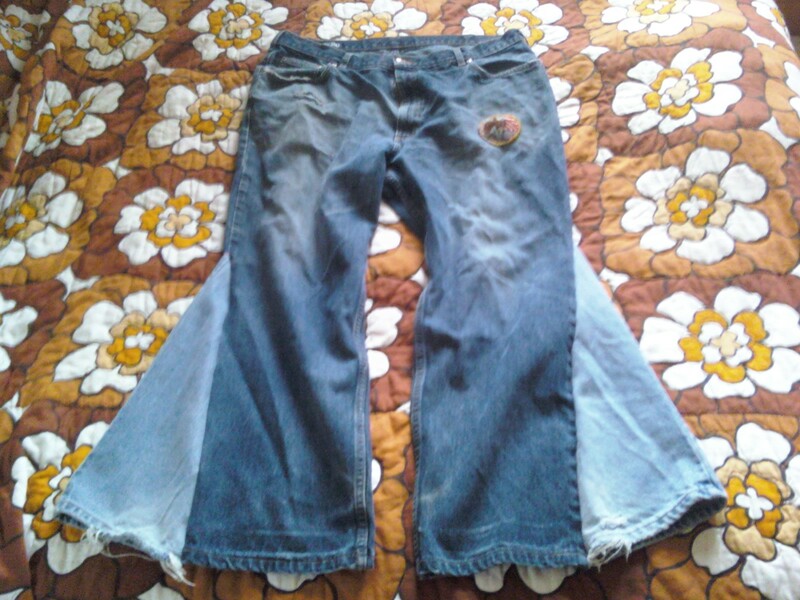 I made my first pair of bell-bottoms in the summer of 1989, just before the 20th anniversary of Woodstock. I’ve made myself many different pairs over the years, but my hands-down favorite pair were created from a pair of vintage kelly green polyester slacks (handed down from my grandmother) that I customized with some vintage acid bright floral sheeting material similar to the pattern on my bedspread shown above, but a hell of a lot brighter. 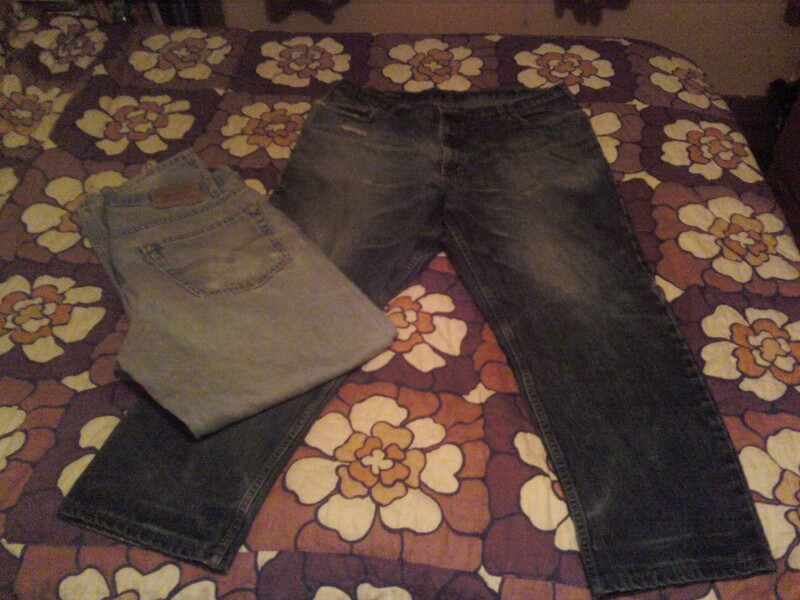 I started with two pairs of jeans. The dark pair was getting very worn and fit well, but no longer work-appropriate. The lighter pair was vintage late 80s/early 90s with a tapered leg and had an odd fit, so I decided those would be the “donor” pants. I like big, wide flares that start around the knee so I turned inside out and marked the spot on the dark pair where I’d add the additional denim. 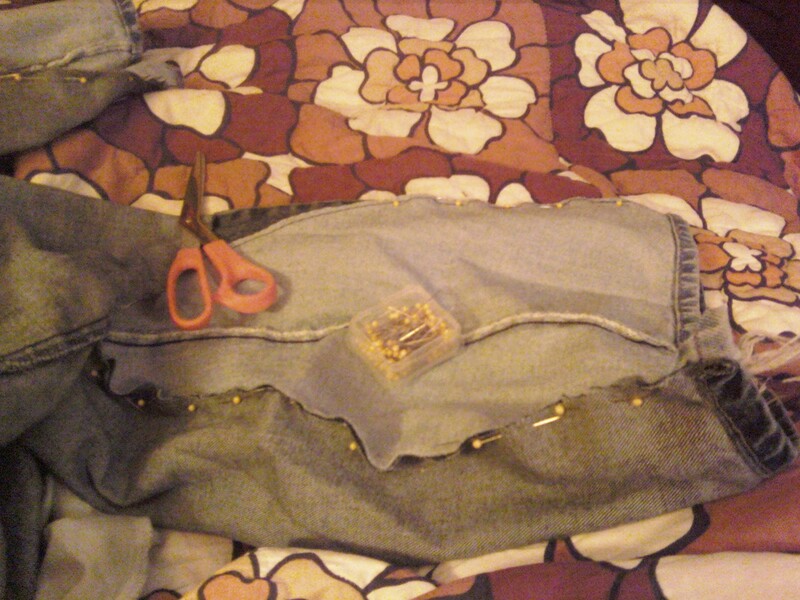 After measuring and cutting the light fabric, I cut the legs off the light par of jeans, reserving the material. I’m thinking of making a shoulder bag for my sister with the top half of that pair. I cut out the strip of fabric with the outside seam on each leg. It’s very hard to sew through, especially by hand, as I do. Next, I pinned the new fabric in, and began stitching it in by hand. As I’ve mentioned, I do all of my sewing by hand. I tried using a machine once and ended up in the ER having a sewing machine needle removed from my finger. Let’s just say that for me, quilting and The Super Bowl aren’t a good mix. 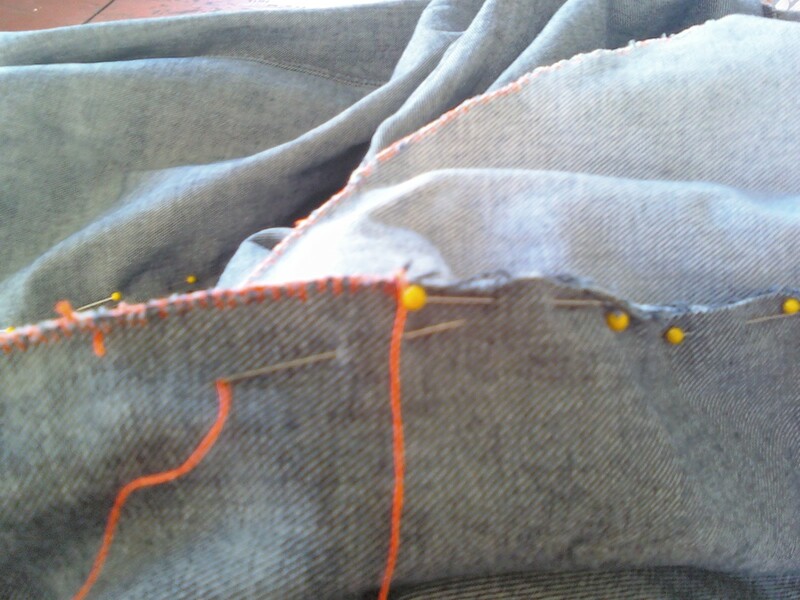 When I’m sewing denim, I like to use a simple blanket stitch. It’s simple, strong, and gives a little shot of color if you use a bright thread like I did. As time goes on, the fabric will settle a bit and the seams will show the thread a little bit. The bright orange thread will add a little bit of visual interest. I’ve been working on this project all week little by little, and just as I was finishing up the last seam, I decided to add a couple of patches. 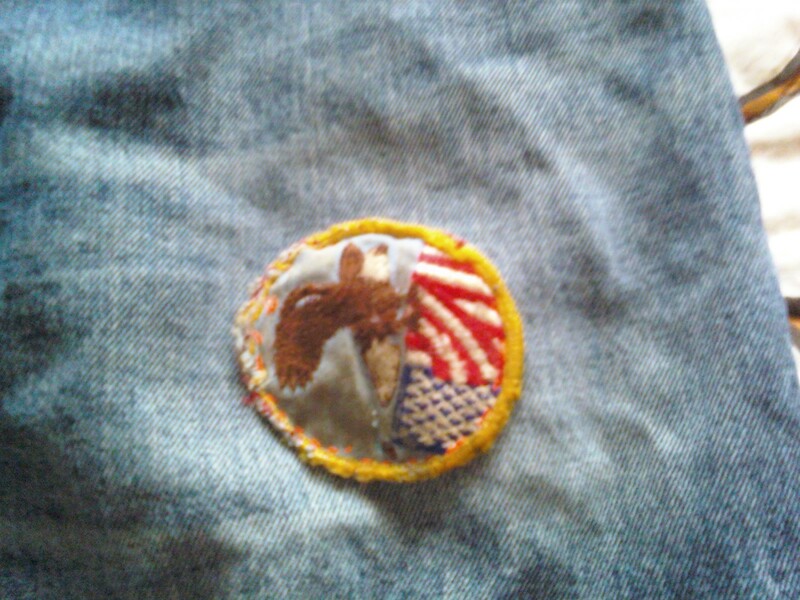 The eagle and flag patch belonged to my father in the early 70s when he was in high school. I rescued it from a pair of cut-off shorts he was throwing away a long time ago. 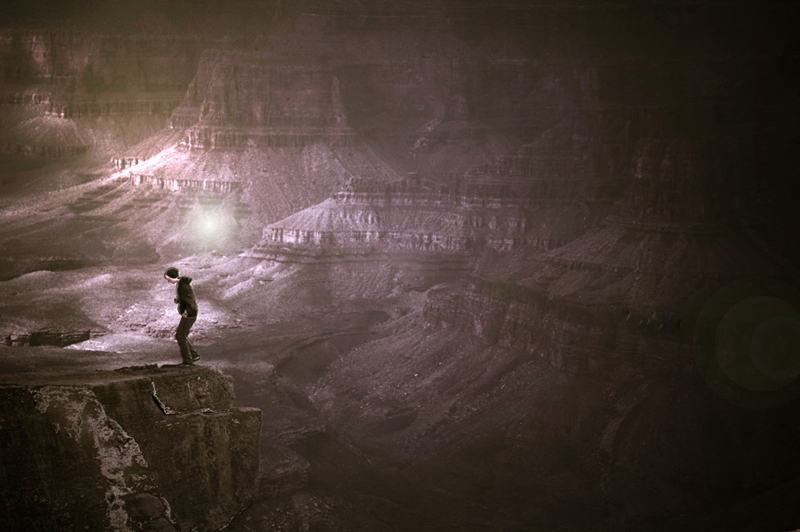 This was taken in the Grand Canyon. There were several young adults taking turns walking backwards to the edge of this cliff. I ran to take this side shot to capture the actual depth of the drop… I can only imagine what their spirit guides were all saying! I’ve been meaning to build one of these for quite some time. As a computer nerd and displaced gear-head who loves working with technological hardware, when I first ran across this idea on the internet I was in love. 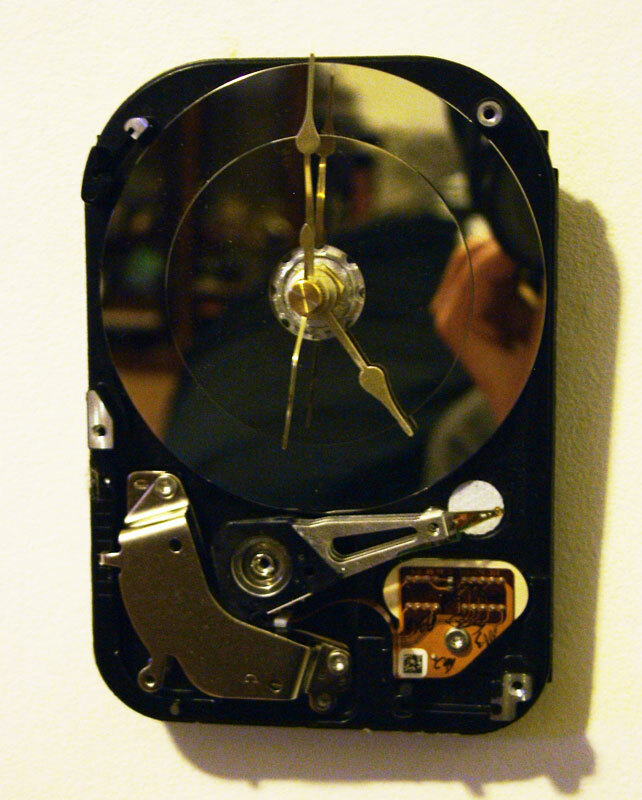 For this project I used a (non functional) 3.5″ Seagate hard drive, super glue, a 3/8″ clock kit, and the platter from a 2.5″ laptop drive. 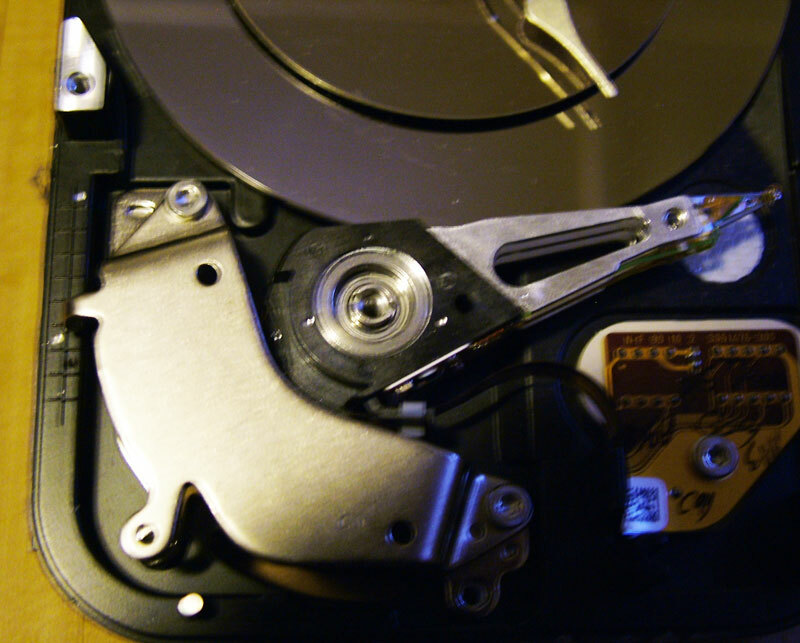 Things went rather well on the tear down, with the exception of breaking the actuator arm on the larger drive, destroying the motor mount and breaking two of the three platters on the smaller drive. The next obstacle was the bearing in the motor– 1″ of solid steel that had to go. After much drilling, hammering, and a sprinkling of profanity, she finally popped out. 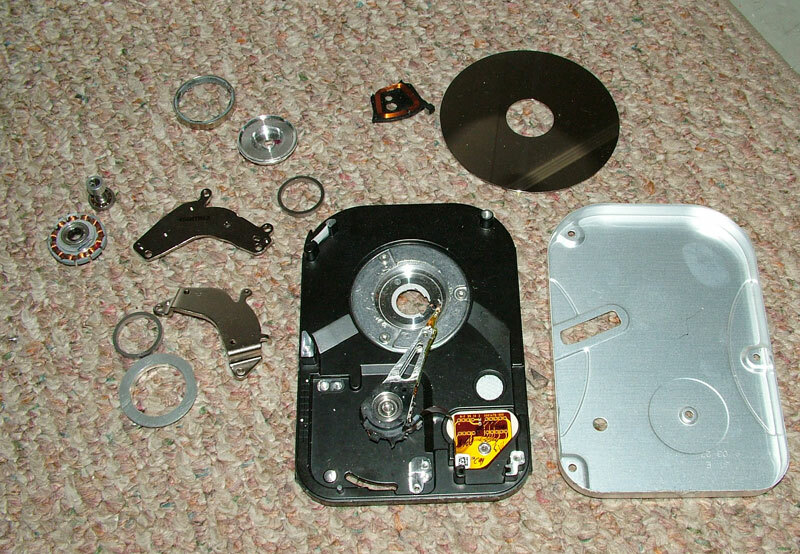 I found a few decent tutorials on the subject at instructables.com, which were great as guidelines, but as all hard drives are not created equal, I soon discovered I was pretty much on my own. The shaft on the clock kit was too wide to fit through the spindle motor, so I used a series of 6 drill bits to bore it out & filed down the rough edges. I also discovered there was no longer any way to secure the platter using the original screws (since I butchered the motor mount), so I had to super glue it in place. I managed to smudge up the surface of the platter with glue, so I dropped the platter from a laptop drive over it to cover the blemish. In retrospect, I rather like the extra depth the second platter adds. 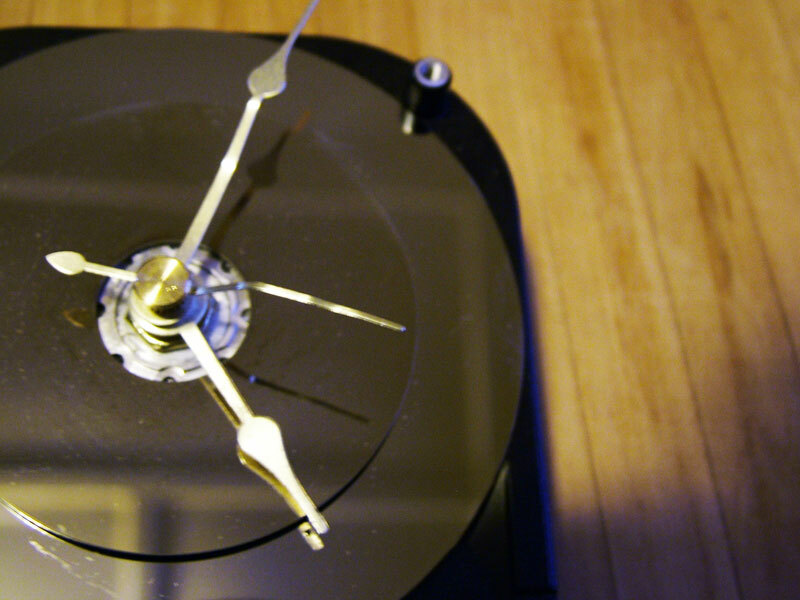 Once I got the clock shaft in (just barely: in the future, I will use a 1/2″ or larger kit), it was smooth sailing. 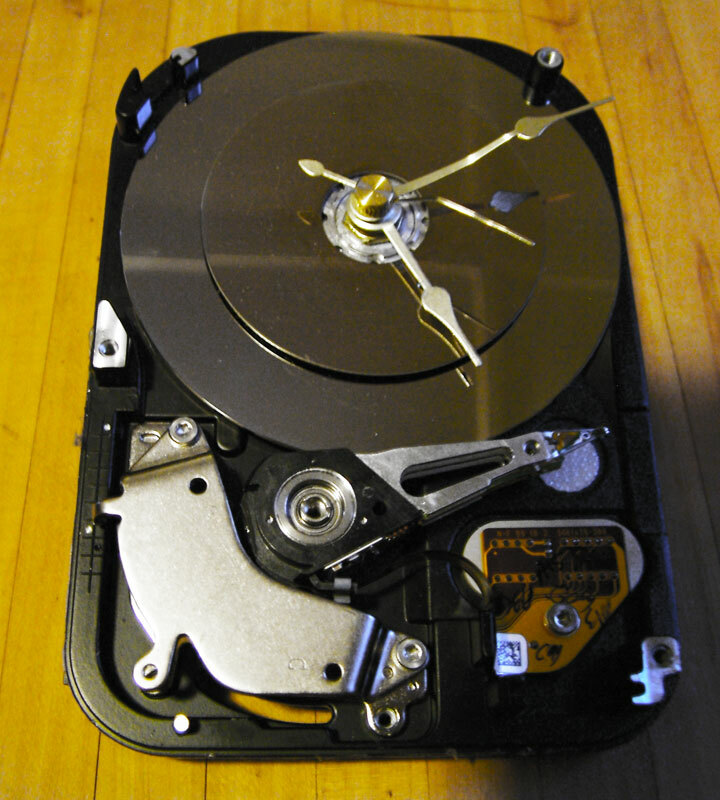 I had to bend up the minute & second hands so they would clear the screw mounts on the body of the drive during their rotations, but I think the wavy hands give it some character. I had originally intended to make this a desktop clock, but figured I shouldn’t push my luck trying to build an easel back for this given the troubles I had early on, so here’s the finished product hanging on my living room wall.